There’s a count-down calendar on this page. See it? Over there on your right… scroll down a little… a little more… Bingo! TWELVE DAYS TO GO! Ahem. ‘pologies. Didn’t mean to yell. This is my second round at ‘The Black Friday Wager’ and my second attempt to finish the first draft of my novel. Well, to be completely honest it’s really more like draft eleven of the first draft of my first novel. ← That makes a weird kind of sense, trust me. The idea behind the BFW is a support network with incentives. We all have goals we’d like to achieve be it with writing, exercise or quitting the smokes… you get the idea. 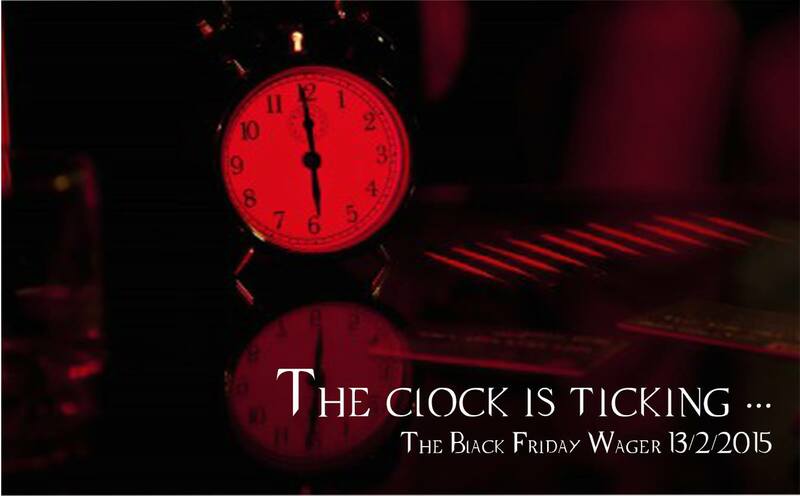 What the BFW allows those in the group to do is set a goal they’d like to achieve by the next Black Friday in the calendar year then another group member takes them up on said goal and a wager is set (decided upon by the two wagees). I didn’t hit my goal last time ‘round, which cost me a bottle of scotch (happily delivered), but I’m very close to hitting my goal of finishing this eleventy-first draft of my novel. With twelve days to go, I just passed the 60,000-word mark, and I know I’m on the home stretch, which holds both relief and excitement. Relief because this is the longest piece I’ve ever written, and there were times when I lost faith in myself as a writer and believed it was just something I could not do. I raged and swore, hated and kicked, and there were quiet moments of despair. Writing a novel is hard; writing a first draft of your first novel can be soul-destroying at times but here’s where the BFW group kick in. Beyond anything else they’re a support network, even those with whom you have a wager want you to succeed as much as you want to succeed. They’re your cheer squad, your sounding-boards, your oracles and your pickers-up when you’re down. I could not have come this far without them and I’ll be forever thankful. And excitement because I can see where this novel is going; I know where the characters are going (not anywhere good, ohh no, not anywhere good at all), I know what they’re doing and what they hope to achieve despite all the crap I’m going to be throwing their way. And it’s a lot of crap. 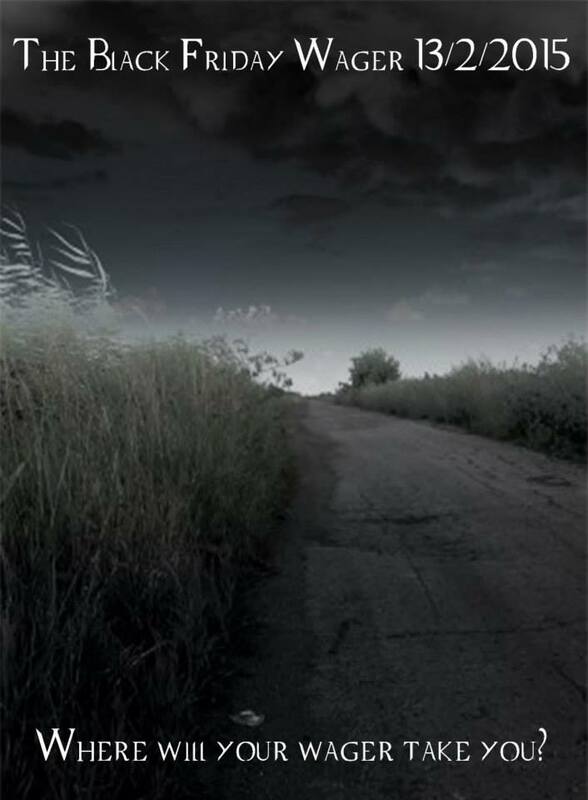 Apocalyptic worlds are never a fun place to be… for them. For me, I’m finally starting to enjoy myself, enjoy the process, and that’s something that’s been seriously lacking. It’s been more stressful than I thought it would be, but that’s due to the unwarranted pressures I put on myself. I’m my own worst critic, and being an editor that tends to double the self-recriminations. It may not be right but it’s honest. Is the draft good? Some of it, yes. But not all. Hell, some of it’s pure shite and I’ll admit that a lot of it will probably go in the rewrite, but it has created a greater focus for the story and a much better understanding of the characters and the world they inhabit. And that is all kinds of good. So, with Friday the 13th closing in fast, my wager with the ever-wonderful and crazy-smart Elizabeth Wayne looks like being a success. And I don’t mean just the success of having a completed draft with ‘End’ sitting at the bottom of the page, or the fact that I’ll receive two illustrations from one of my favourite artists – Jeannie Lynn Paske – but the success of understanding that I can write long pieces, that I can be kind to myself – I should – and that maybe the short-story form isn’t the only place I can lay my hat. ELEVENTY-FIRST, IT’S TIME TO END YOU! Previous PostReview: Dying Embers by M.R. CosbyNext PostHorror and Writers and Interviews, oh my!